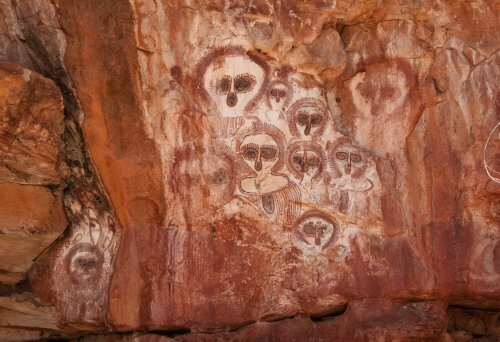 Bradshaw rock paintings found in the north-west Kimberley region of Western Australia. Photo: Graeme Churchard. Source: Wikimedia Commons. Lynne, the sister of a close friend in Philadelphia, became a foster parent a few years ago. She and her partner, Mandy, were assigned a little boy whom I will call Diery. He had lived his first six months in the care of a mother who abused drugs and abused him, and he was bruised both physically and psychologically. Over the next three years, Lynne and Mandy slowly rebuilt him, and under their care, he thrived. He was a happy, intelligent, secure little boy. Lynne and Mandy were told that they would be able to adopt him, and they began the legalities of doing so. But when he was three and a half, his biological mother initiated the process of reclaiming him. At first, that meant just supervised visits. Diery complained bitterly every time he had to go on one, said he was terrified of this strange woman, and clung to Lynne and Mandy for dear life. Nonetheless, social services prioritised the birth mother, and after a few months of battle, he was returned to her. Despite Lynne’s and Mandy’s pleas, Diery’s birth mother refused to allow any further contact with them. They have not even seen a photo nor heard a report on how he’s doing since Christmas. That’s traumatic for them, of course, but it’s hard to believe it’s not yet more traumatic for him. Living through the saga has given me a new appreciation for the complexity of the choice between the birth parent versus the non-birth one. I suspect that Diery is having a rough time in the household to which he has been returned, and that the damage of being ripped away from the people he thought of as his parents, never to hear from them again, will cause permanent harm. At the same time, I believe that parents have a right to their children, and that a mother who has achieved control of her addiction should be given the opportunity to bring up her own child. But is this mother actually through with her substance issues? Will she provide anything other than a life of chaos and woe for her child? If a child has become deeply attached to parents who have cared for him since infancy, is the call of the biological mother really more important than the continuity of affection and competence of the mothers? I’ve thought a lot about this conundrum as I’ve read about Australia’s stolen generations and pondered whether removal is currently enacted unduly often with Aboriginal Australians. The rationale for the removal of the original stolen generations was that all Indigenous Australians were inherently incapable of being good parents, and that moving their children into white families or institutions would produce better and more functional citizens. The idea behind today’s removals is not that no Indigenous Australian can be a good mother or father, but that many specific Indigenous Australians have defects that undermine their parenting. There are two questions attached to the removals idea. First, how dangerous are the birth parents? And second, how good are the other options pursued? Belonging to a racial minority does not make you a bad parent; neither does poverty in and of itself. Inflicting violence on your children does. Removing a troubled child to a warm, loving, coherent family may ameliorate his or her difficulties. Removing children to faceless institutions where they will receive generic care, or into abusive households where they will be treated like slave labour is unlikely to give them much of a good life. Australia is hardly alone in such a history. One cannot forget the concentration camps designed to kill off entire populations from Namibia to Libya, nor the distribution in North America of “smallpox blankets”, presented to Native Americans as gifts, and intended to wipe out everyone who touched them. The stealing of Indigenous children in Australia is marginally less awful than that, but it fits with the same colonial aspiration to dismantle cultural identities. The thefts of children were intended to erase the Indigenous culture, if not the Indigenous people. De-culturalization seldom works; the people who have their culture ripped out of them do not automatically assume the alternative culture provided them. Trying to make Indigenous Australians into white people is a bit like trying to make gay people straight: a very great deal of energy has been expended in this direction and nothing has been accomplished by it. About one in ten Indigenous children was removed forcibly during the stolen generations. “It was a presumption for many years that we girls would grow up and marry nice white boys,” said Barbara Cummings, an Aboriginal woman who was a member of the stolen generations. “We would have nice fairer children who, if they were girls, would marry white boys again and eventually the colour would die out.” This is obviously a scandalous project. Kidnapping is less likely to achieve this integrative goal than is the creation of a peaceable and equitable social structure in which intermarriage would become commonplace and the parameters of race would blur. In the original stolen generations, mothers who loved their children had them removed to serve a misguided social purpose. The mothers could never recover from their heartbreak, and neither could the children. The assimilation that was proposed didn’t really take place. The process served the interests neither of families nor of the state. The children themselves were dealt with in a curiously contradictory fashion: trained to be servants, often sexually and physically abused, made to feel shoddy for their origins; and then also expected to marry white people and to integrate into white society. This is a profound ambivalence: we want to absorb otherness into ourselves, and we want to cast it out of our experience altogether. As of 30 June 2013, 13,914 Indigenous children were in out-of-home settings in Australia; in New South Wales, one in three Aboriginal children is in care. The horrifyingly elevated level of removals reflects genuine problems in Aboriginal populations, including addiction, tendency to violence, extreme poverty, high rates of mental illness, and a lack of regard for schooling, hygiene and responsible healthcare for children. But the solution to those problems in the long term would be to help Indigenous Australians make sense of a modern world into which they were rather cruelly catapulted when Australia was first settled. Our ideas of what constitutes responsible parenting are strongly culturally determined, and members of other cultures have the prerogative to define such matters for themselves. An Australian childhood is different from a Congolese one; a 20th-century childhood is different from an 18th-century one; a gay childhood is different from a straight one; a fundamentalist childhood is different from an atheistic one. It may be that many Indigenous childhoods look all wrong to those who regard them from the fortress of their own system. Yet it may well be that such childhoods make sense to the families enacting them – and that the removals, which now seem so “rational” will seem anything but to the generation that follows ours. There are no absolutes in these games. There are some households that are worse than loveless, that are actively destructive, and children in such households may need to be rescued. Returning everyone to their birth parents is not the answer. I think of my friends and their foster child, and how a system working from exactly the right principles has effectively consigned a child who was full of hope and joy to a life that is likely to be a disaster. Some children clearly need rescuing; some children clearly don’t; a vast number fall in a murky middle. Determining how to deal with them requires enormous sensitivity, including cultural sensitivity. Some of the removals currently taking place are doubtless appropriate, but many likely spring from applying one culture’s standards to another. Those unfairly removed children and all the rest of us will live out the legacy of that disaster.